After official unveiling at Mobile World Congress in Barcelona a few weeks ago, the Samsung Galaxy S5 made public its authorizations in the FCC OET (Office of Engineering and Technology) database at the start of this weekend. All of the domestic variants are there, including the A3LSMG900P, which in its tri band LTE configuration and "P" designation is the obvious Sprint variant. As expected of a Sprint high end handset, the Galaxy S5 ticks off all of the checkboxes: tri band LTE, UE category 4, global roaming capability, 802.11ac, NFC, wireless charging, etc. It also appears to improve upon the RF output of last year's single band Samsung Galaxy S4 and Galaxy Note 3. From a common uplink EIRP standpoint, the Galaxy S5 can max out up to 3-4 dB greater on band 25 LTE 1900, hitting 26.85 dBm in the middle of the PCS band, falling off 1-2 dB at the extremes of the band. Additionally, band 41 LTE max output looks relatively healthy at 25.03 dBm. Of course, with no separate CDMA2000 and LTE antennas, as depicted in the diagram above, the Galaxy S5 does not support SVDO nor SVLTE. No surprises there, since Sprint tri band LTE handsets have all been single radio path with e/CSFB. But continuing on the Wi-Fi front, the Galaxy S5 does include a unique simultaneous transmission mode: Wi-Fi and LTE. Now, this is not simultaneous Wi-Fi and LTE in the typical sense that Wi-Fi is used to tether an LTE connection. This is a dual IP stack connection over both Wi-Fi and LTE that Samsung dubs Download Booster, allowing packets to be split up and delivered by both connections, thereby increasing data speeds. Editorially, S4GRU has some concerns about inclusion of the bonded connection Download Booster, since it may engender "unlimited" data users to remain connected to LTE, too, while on secure Wi-Fi at home, work, school, etc. In most cases, Wi-Fi alone is sufficiently fast for all smartphone activities. And that is why S4GRU has long advocated offloading to Wi-Fi -- when/where possible and secure -- so as to help maintain valuable LTE capacity for truly mobile users. That said, we are curious to see the real world implementation of Download Booster before passing judgment. Finally, many hoped that the Galaxy S5 might be the first Sprint handset to support LTE Advanced carrier aggregation because Sprint plans to use its acquired Clearwire spectrum to aggregate multiple band 41 20 MHz TDD carriers. That capability, though, will have to wait for the presumed Samsung Galaxy Note 4, Galaxy S6, or some other device. The carrier aggregation omission is worth mentioning only because the A3LSMG900A variant headed to AT&T does support inter band downlink carrier aggregation. This allows the Galaxy S5 to bond up to 10 MHz FDD of AT&T's low frequency band 17 LTE 700 with up to 10 MHz FDD of its mid frequency band 2 LTE 1900 or band 4 LTE 2100+1700. Indeed, AT&T carrier aggregation is already in use in Chicago, as Gigaom's Kevin Fitchard reported last week. Well, that is the FCC skinny on the upcoming Sprint variant Galaxy S5. Nothing revolutionary on the cellular side of things, but with MIMO and Download Booster, it does offer up some interesting Wi-Fi enhancements. Previous entry Teaser: How does HTC M8 RF performance stack up? Separate CDMA2000 and LTE antennas are required for SVLTE, but they do not enable SVLTE. That requires separate RF paths, which this handset does not have. Also, the distinct band 41 antenna pair is not out of the ordinary. We have seen that on most, if not all of the tri band handsets so far. The key point, though, is that the main antenna pair is not distinct between CDMA2000 and LTE. Hope that battery is a trooper. My Trooper has a battery. Does that count? You guys could serve hard time for battery on a trooper. How does Band 26 output look like? Better than the S4T? If Part 90 SMR 800 MHz testing includes only conducted power, that tells us little about radiated power. So, it is not a valid basis for comparison. And we can report only the data provided to the FCC. Hmmm. Could the simultaneous WiFi and LTE be Multi-Path TCP? That preserves a smooth user experience, even when transitioning between WiFi and LTE signal areas (going into a basement or walking out of a Starbucks) that would otherwise tend to inspire a few choice curse words. Not sure if that's snow on the ground, or y'all have white asphalt.... In Charlotte no Target would be open with wintry precip all over the place (assuming white asphalt not). That is definitely Dakota Snow. "This is a dual IP stack connection over both Wi-Fi and LTE that Samsung dubs Download Booster, allowing packets to be split up and delivered by both connections, thereby increasing data speeds." 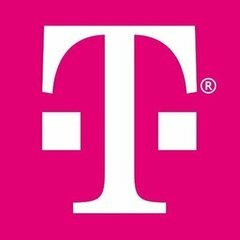 This might be premature, but is it possible for the network to deny packages over LTE using "Download Booster" based on network conditions? Or at least make them a low priority? I would think this feature would be nice to have when network congestion isn't an issue.... although I would hope the network has some control over the manner in which it's used. Not really. The macro network has no means to determine that some of the packets are being delivered over Wi-Fi, some over LTE. This is our cause for concern. 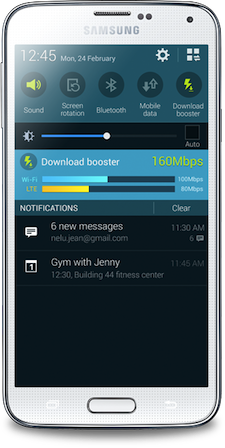 Download Booster can or will increase macro network loading in exchange for slightly faster data speeds. Im curious, If sprint isn't concerned about loading with it (by not disabling it) then why are we? I understand responsible use of the network but it doesn't appear at the moment that there is any concern about it from sprint. Also I thought I heard something about this only activating with downloads over a certain size. I want to say 1gb but I could way off on that. If that is the case then that sounds like it will rarely get used. I think the better question is, what is their options? Disable the function? Opt out of carrying the S5? Or accept the device for its pros and cons? The first two options would be a pubic relations nightmare. People would ask the question, "Why Sprint and no one else?" So, the "grin and bear it" option seems to be the best choice. I wouldn't infer that that choice means it won't have a negative impact on the network though. Of course, it may not be all that bad. This is mere speculation and reading tea leaves. Thanks for taking the time to write these articles. I find them most interesting and informative. Again, thanks for including the EIRP data! Im curious, If sprint isn't concerned about loading with it (by not disabling it) then why are we? I understand responsible use of the network but it doesn't appear at the moment that there is any concern about it from sprint. We do not want these comments to turn into a heated debate about "unlimited" data abuse. Those never end well. But to respond to your question, Sprint has little market power right now to show any concern for or disable Download Booster. As chappo2000 points out, the "grin and bear it" strategy may be Sprint's only tenable option right now. For illustration at S4GRU, we like to use the all you can eat buffet analogy. If one or two people are being rude by hogging far more than their fair share while the restaurant is doing nothing to stop it, that does not prevent the other patrons from confronting the "unlimited" food abusers. And that is basically what we are doing at S4GRU when we highlight current or potential problems with "unlimited" data, such as use of Download Booster. Multipath TCP is particularly useful in the context of wireless networks  - using both Wi-Fi and a mobile network is a typical use case. In addition to the gains in throughput from inverse multiplexing, links may be added or dropped as the user moves in or out of coverage without disrupting the end-to-end TCP connection. The problem of link handover is thus solved by abstraction in the transport layer, without any special mechanisms at the network or link level. Handover functionality can then be implemented at the endpoints without requiring special functionality in the subnetworks - in accordance to the Internet's end-to-end principle. If that were indeed the case, the impact to the macro network would be negligible, whereas the user experience transiting between cellular and WiFi would be a big win for Sprint (and its users). At this point it does not seem we have enough information to definitively say either way. think about what part of the phone sticks out of your car slots most often? It is usually the bottom. on these larger handsets the bottom is also usually exposed. Also they need to minimize radiation from the antennas to the main chipset..the farther away the better.. Does this thing support LTE channel widths other than 5Mhz on band 25? I am going to put something into perspective for those who do not like the download booster or think that sprint is not actually in favor of this. Sprint has software currently called 'sprint connections optimizer' (at least on my GS4) which tries to switch to wifi even when I do not try to or even have the wifi on... this was not always the best choice as many public wifi's require a sign in, and therefore I could not use the internet/apps until I turned off the wifi or went to the sign-in page... This has resulted in a worse customer experience, and a personal habit to turn off the wifi toggle before doing anything while not at home. This is a stupid idea. Using the network while in range of wifi will place unnecessary load on the network. I turn on my wifi as soon as I have data intensive things to do if possible. I usually don't use it because my Sprint connection tends to be more consistent than public wifi around here and most of what I do is not data intensive, but rather small things like parts orders, electronic mail, etc. I just hope the providers have a way to turn it off from their end when the user is connected to an overloaded site/carrier. It sounds like the simple solution would be if Sammy configured the download booster to only remain on for like 30mins after enabling it and after, revert back to just WiFi. This would help drive the point to the consumer that it is a feature that should be used only in certain situations and not to be left on all the time. I really only see this being useful when downloading a large file quickly, which sometimes could come in handy when in a pinch. Plus I'm sure leaving it turned on will kill your battery twice as fast.